Singapore: Trade officials from 16 countries that are negotiating the Regional Comprehensive Economic Partnership (RCEP) are meeting in Singapore this week to advance this ambitious mega-Free Trade Agreement (FTA), however civil society has been shut out. Civil society has worked hard to gain access and a voice in previous rounds, although not nearly enough. At the negotiating rounds in the Philippines, Indonesia, Japan, South Korea and India, key representatives of civil society were at least invited to share their concerns. The Singapore government has gone backwards. Today, it hosted Transnational Corporations (TNCs) and other local business groups at a Business Dialogue to identify their interests and concerns. Trade unions, farmers and civil society organisations who will be adversely affected by RCEP were excluded. The negotiations to further open up and deregulate sectors such as agriculture, public services, manufacturing and the digital economy are taking place under complete secrecy and no text has been made public, despite that the negotiations have been on-going for the past six years. “ASEAN governments have been asserting ASEAN centrality throughout these RCEP talks. Meaningful consultations are important to voice the concerns of people. The consultation in Singapore has effectively shut out peoples’ voices and instead provided privileged access once again to business. 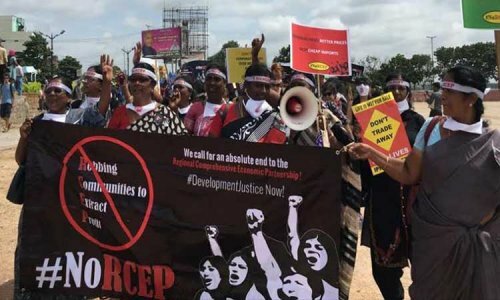 This exposes further the democratic deficit in the RCEP process”, said Joseph Purugganan, of Focus on the Global South and convenor of Trade Justice Pilipinas . “People living with HIV across the world have benefited from generic competition from India, which dramatically increased access to affordable medicines. We are extremely worried that Japan and South Korea continue to attack this lifeline by pushing for harmful IP provisions in RCEP negotiations. At this negotiating round in Singapore, it is disheartening to note that while multinational corporations find place at the stakeholders meeting and are being consulted, HIV positive people — whose lives are at stake — in the IP negotiations of this trade agreement are being kept in the dark,” said Paul Lhungdim, from Delhi Network of Positive People. "The Governments and TNCs gathered in Singapore are deciding the rules for tomorrow’s digitised economy. It defies logic that workers, whose fundamental rights will be directly affected by these new rules, have been completely shut out of this process. Meaningful engagement with workers and other affected communities from across the region is a necessary precursor for workers to exercise their democratic rights; what we have seen here makes a mockery of these rights." said Building and Wood Workers International (BWI) Regional Representative Apolinar Tolentino. BWI represents close to 4 million workers in the Asia-Pacific region, with affiliate unions in thirteen of the sixteen RCEP countries. Civil society members are also gathered in Singapore for their own meeting on RCEP reminded their governments that it is their collective responsibility to ensure that, as a minimum, inclusive and comprehensive stakeholder consultations are held as recognised inputs into each round of negotiations. Country representatives cannot hide behind the lack of political will of the host country and need to ensure that minimum standards for enabling meaningful and inclusive stakeholder input is set for future rounds of RCEP negotiations.